Something lurks beneath the surface of the crowd. It grows closer and closer until BAM! You’re face to face with the Fin of Foreboding. 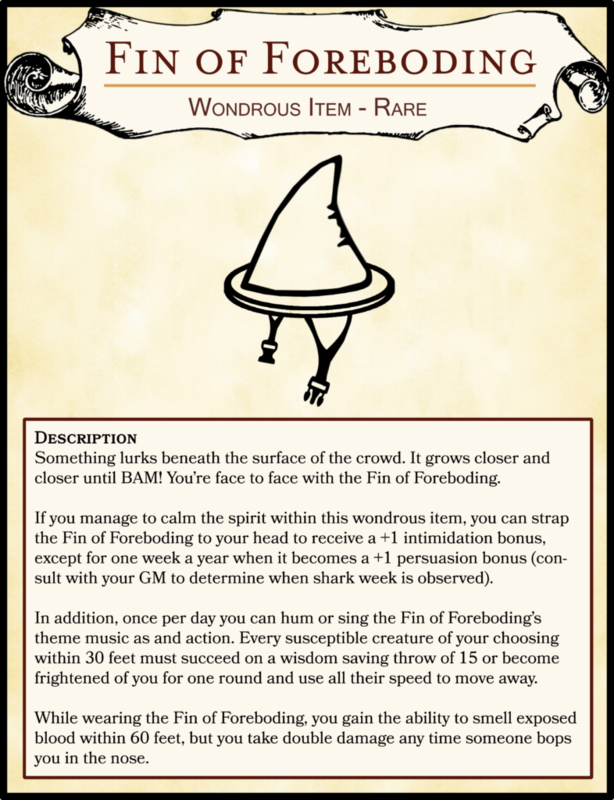 If you manage to calm the spirit within this wondrous item, you can strap the Fin of Foreboding to your head to receive a +1 intimidation bonus, except for one week a year when it becomes a +1 persuasion bonus (consult with your GM to determine when shark week is observed). In addition, once per day you can hum or sing the Fin of Foreboding theme music as and action. Every susceptible creature of your choosing within 30 feet must succeed on a wisdom saving throw of 15 or become frightened of you for one round and use all their speed to move away. While wearing the Fin of Foreboding, you gain the ability to smell exposed blood within 60 feet, but you take double damage any time someone bops you in the nose.